DVD-RW or Digital Versatile Disc ReWritable is an optical storage disc of the DVD format that shares the same sizes as the DVD-R, however a DVD-RW can be written, re-written, and erased safely up to 1,000 times. They are likely to remain readable by the user for up to 30 years; however, manufacturers and changing technology can affect this lifespan. DVD-RW was first introduced in Japan’s technology market in 1999, but due to compatibility issues, did not function properly with most DVD devices until a year later. This optical storage disc is ideal when it comes to frequent data backups. 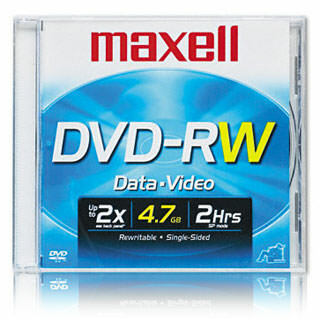 The technology behind the DVD-RW is similar to the CD-RW. This media can be single or double sided, as well as single or double layered. An alloyed recording layer alters between crystalline and nebulous states to enable re-writing and erasing. The recording side may have multiple layers starting with a pre-grooved polycarbonate layer. Microscopic pits and lands (lands are the flat areas between the pits) rest between the spiraled tracks and grooves in a location known as land pre-pits (LPP). An electric insulation layer is covered on the disc next to draw excess heat away from the recording layer. Another alloyed recording layer is placed on followed by another dielectric layer. A subsequent metallic layer helps reflect the laser beam to read the disc’s data. A “dummy” disc of polycarbonate substrate and a metallic topcoat is bonded with the rest of the disc in order to protect the recording layers from damage. By and large, DVD-RW discs are compatible with DVD-R general writers, DVD-RW writers, and some dual RW recorders. DVD-RW media can be read by most DVD-ROM drives, DVD-R recorders and consumer DVD electronics. However, due to the lowered reflective nature of the DVD-RW discs, random incompatibilities can arise with certain manufacturers. DVD-RWs have built-in provisions to adhere to strict copyright laws. These measures (CSS and CPPM) aim to deter illegal copying and protect commercial movies or music from direct digital distribution. The systems encrypt sectors of the disc that cannot be unlocked unless in playback mode.